Northeastern Adventure Of Cambodia: Phnom Penh – Kompong Cham – Kratie – Sen Monorom – Rattanakiri – Stung Treng. Today is our first day of this 8-day Northeastern Adventure Of Cambodia. From Phnom Penh, we ride to Kompong Cham Province via the town of Skuon, famous for its deep fried tarantulas! In Kompong Cham we take a look at the hilltop temples of Phnom Srey Phnom Bros (Woman and Man Mountain). After lunch in Kompong Cham we follow a scenic trail along the Mekong river through numerous fishing villages to the quiet, riverside town of Kratie. where we spend the night in a comfortable new riverside hotel. A relaxing day around Kratie. Take a boat onto the Mekong to catch a glimpse of Cambodia’s rare Irrawaddy dolphins, and have lunch on stilted platforms over the river. After lunch, we visit the hilltop pagoda of Mouy Rouy and take a ride through Kratie’s villages and countryside for a feel of rural life. We leave Kratie on Route 7 before joining the old route to Mondulkiri; a winding trail through the wilderness to the provincial capital of Sen Monorom. 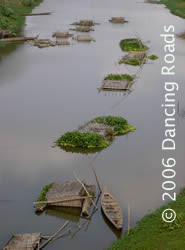 A great day’s ride with river crossings, and ox-cart tracks for those up for an adventure! Leaving Sen Monorom, we take an ox-cart track through forests and rivers to Bousra waterfall, the largest in Cambodia. After that, it’s short bike ride to the elephant-trekking village, where we alight our bikes in favour of a different kind of ride. Guided by hill tribe members, we travel by elephant through the jungle, hills and hill tribe regions of this stunning province before returning to Sen Monorom and our pretty bungalow lodging. We begin our journey through one of the most remote and beautiful regions of the country, aptly nicknamed ‘Death Highway’ for its adventurous conditions. Riding through sand, ruts and elephant grass, we arrive in the isolated village of Koh Nheak, where we fill up on supplies and stay the night with a local family. And so the ‘Death Highway’ continues! Crossing the Srey Pok River, the fictitious dwelling of Colonel Kurtz in Apocalypse Now, we make our way to Banlung, the provincial capital of Rattanakiri. We spend the rest of the day relaxing at the breathtaking volcanic lake of Yeak Laom, believed to have been formed over 700,000 years ago. Surrounded by bamboo groves, this area is considered sacred by local hill tribes. After breakfast, we begin our day with a ride to Voeunsai National Park. Here we transfer to a boat and head upriver to a Jarai minority village, where we learn about their everyday lives and animist beliefs, visiting their haunting cemetery with its totems and ghost houses. After returning to Banlung, spend the rest of the day at your leisure around this quiet provincial capital. 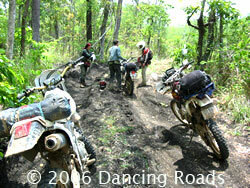 As our journey nears its end we depart Banlung and head through the lush jungles of Rattanakiri on our way to Stung Treng. From there it’s a short boat ride up the Mekong River to the Laos border, where we bid our farewells to Cambodia. (replaces days 1-3 in above route). We make our way through the rubber plantations of Memut and Kompong Cham. Then ride the hills of Mondulkiri province before arriving in Sen Monorom. Contact us now in case you want to know the current price for this tour or to know about different itineraries.